(PhysOrg.com) -- We tend to think of our cell phones as our own person technological domains. They are the places where we can store our digital life and keep an eye on the things that we need to, while we are on the go. But, what if your data is not you own, what if it is used against you in a court of law? Those are the allegations made by the American Civil Liberties Union against the Michigan State Police. They claim that they have been using technology to clone your cell phone data and use it against drivers for issues as trivial as a traffic stop. That data could include your photos, videos, e-mails, and GPS locations. The Michigan State Police have been accused of taking cell phones from people at traffic stops and cloning those phones. 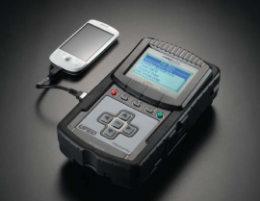 The devices used, called the CelleBrite UFED, were initially designed for forensic use, and now they may be being used in the field by patrol officers. These devices are capable of cloning the data that is stored on more than 3000 different models of cell phones. Security protections, including pins are not stopped by this device. It is even capable of accessing data that have been deleted on the phone, data that is no longer available to the phones owner. Requests by the ACLU to see log data from the Michigan State Police was met for a demand for half a million dollars to pay for the costs of retrieving the information. The ACLU replied to that request with a public letter that made reference to the constitutional rights of citizens and the possibility of litigation Currently, no other steps have been taken. Add to this that Apple iphone secretly tracks your every move and you get the perfect recipe for no privacy at all. Now of course you can always decide to leave your tracking iphone at home if you want to commit an illegal act, like spitting on a passing car. So we should change the saying to " if it's an iphone, leave home without it", or better yet, don't buy it. I think the Michigan State police may be in BIG and I do mean BIG trouble if they've been doing this. It would be about as clear a violation of the 4th amendment as there is to search something as sensitive as your cell phone for something as trivial as a traffic stop. Just get some GPS and cell jamming devices. I never leave home without them. who needs GPS anyway, I know where I want to go. must be one of the few people left who knows how to use a map, they're awesome. work anywhere and never need batteries. Does this "map" give you up to the minute traffic conditions and road hazard avoidance advice? Does it update itself automatically when roads are changed? Does it narrate turn by turn directions to you so you don't have to take your attention off of the road? Does it audibly warn you when you are speeding, possibly saving you hundreds in accidental speeding fines? the coordinates were written to a secret database. I am not sure if they can be deleted or if they can be retrieved by a third party without the user knowledge. I think it's scandalous that apple thought it could get away with what it did. I will never buy anything from apple. I wouldn't broadcast the use of an electronic signal jammer if I were you. They tend to be frowned upon by law enforcement -- and government -- agencies alike. And remember, there are "home on jammer" devices. As for the map reading ability, great. Just make sure that you either have a competent navigator, or can pull over to the side of the road to use the map when what you see out the windshield isn't what you have on the map. The secret tracking is justification for my refusal to purchase or endorse so-called "smart" phones. However, do not take that sentiment to mean that I am against use of cell phone data in a court of law - I support it. Namely, if I am involved in a traffic accident with another vehicle and I know I am not at fault, I am going to want to demand the other person's cell phone record as potential evidence to be reviewed to see whether the person was talking or texting on their cell phone at the time of the accident. Namely, if I am involved in a traffic accident with another vehicle and I know I am not at fault, I am going to want to demand the other person's cell phone record as potential evidence to be reviewed to see whether the person was talking or texting on their cell phone at the time of the accident. If you are going to commit some sort of heinous crime I would suggest you take the batteries out first. Or leave your phone somewhere else... as your alibi. :) Better yet, just don't commit a crime. I wouldn't use GPS jamming tech if I were you. GPS signals are used as accurate clocks in everything from many phones to ATMs. The US Navy jammed GPS a few years ago while near a city (as a combat exercise), and they shut down most of the city for hours. No one knew what has happening. It took months to figure it all out (even the Navy didn't realize their jammer would have that kind of effect). In another interesting episode, a major airport was finding that its new air traffic control system was being knocked out twice a day, like clockwork (within minutes). After a lengthy investigation they discovered the culprit: a trucker on a nearby freeway was using a GPS jammer to avoid paying automated tolls (which use GPS for their clock signal, and can thus be jammed). Estimates that I've seen suggest that a single jammer on a tall building could knock out the GPS signal over most of a city. You can buy them online for about 30 bucks, although they're illegal in many places. Gps depends on recieving signals from satelites so if you put the cell phone inside of metal container with a tight fittng lid it will not be able to record your movment of course it will not recieve calls while in the box but some states have outlawed using a cell phone while driving. With any cell phone GPS or not it is possible to track your position and cell phone towers can be used as a form of radar to track aircraft also by trianglation of signals. You realize any cell phone can be tracked via triangulation of the signal between the cell transceiver towers right? Also, I just read somewhere else that it was not your phones GPS coordinates that were being logged, it was the cell tower that you were connecting to. Apple has stated that it does this to keep track of which towers you are most often in range of and this somehow (I don't disbelieve them, I just don't know how) this helps them save battery power and increase network performance.